The Stimulus Bill creates a new federal bureaucracy that will make health care decisions for you. Called the National Coordinator of Health Information Technology, this group will monitor treatments to make sure your doctor……. "is doing what the federal government deems appropriate and cost effective". The goal is to reduce costs and "guide" your doctor's decisions. Pages 442 and 446. Hospitals and doctors that are not "meaningful users" of the new system will face penalties. The bill further forms the Federal Coordinating Council for Comparative Effectiveness Research. The goal of this group is to "slow the development and use of new medications and technologies because they are driving up costs". Tom Daschle authored these provisions and he praises Europeans for being more willing to accept "hopeless diagnoses" and "forgo experimental treatments" and he chastises Americans for expecting too much from health care. He says health care will not be pain free. Seniors, in his words should be more accepting of the conditions that come with age instead of treating them. This means the ELDERLY WILL BEAR THE BRUNT. The federal council is modeled after a U.K. health board which approves or rejects treatments using a formula that divides the cost with the number of years you are expected to live. This determines whether treatment is "worth it". In 2006 the U.K. Board decreed that elderly patients with macular degeneration had to wait until they were blind in one eye before they could get a costly new drug to save the other eye. It took three years of public outcry to reverse this. If this sounds like a nightmare it's because it is. Do you want the federal government to decide your health care decisions? If not, you need to contact your federal representatives NOW. In what many are describing as a "good surprise," former Maryland Lt. Gov. 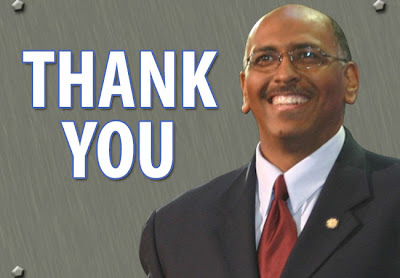 and Fox News Contributor, Michael Steele, was named the chairman of the National Republican Committee this weekend. Steele is known as a personal and fiscal responsibility GOP'er, the roots many in the party would like to return to according to articles popping up across the entire blogosphere. 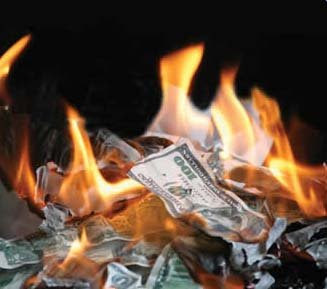 All three Macon Co. legislators, Stouffer, Shively, and Sander voted for a Republican plan stopping pay raises for the legislators and judges. HCR 5 passed with a vote of 129-31. 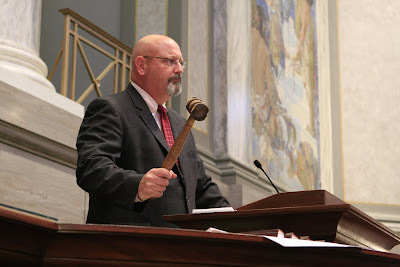 Two Northeast Missouri Democrats opposed the bill, Reps. Bringer and Witte. "While my husband and I were on the road yesterday we heard a news report that Senator Gregg [R-New Hampshire] is being considered for a position in the Obama administration. As you know, NH has a democrat governor, this is a strategic move on the democrat's part to put a democrat in his seat in congress. Several online groups have asked that people start writing letters to Senator Gregg encouraging him to decline the offer, to stand by our party and not put us in a position of weakness by decreasing our numbers and strength in congress. It would guarantee them a filibuster proof congress. Please pass along this information and help us, loyal Republican members, communicate with Senator Gregg about the serious impact his decision has on our party.